In an example of life imitating art, biologists and bioengineers at UC San Diego have created a living neon sign composed of millions of bacterial cells that periodically fluoresce in unison like blinking light bulbs. 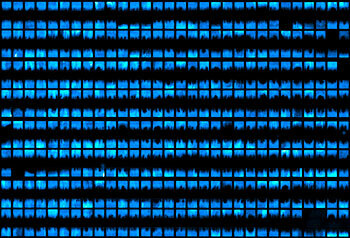 Their achievement, detailed in this week’s advance online issue of the journal Nature, involved attaching a fluorescent protein to the biological clocks of the bacteria, synchronizing the clocks of the thousands of bacteria within a colony, then synchronizing thousands of the blinking bacterial colonies to glow on and off in unison. A little bit of art with a lot more bioengineering, the flashing bacterial signs are not only a visual display of how researchers in the new field of synthetic biology can engineer living cells like machines, but will likely lead to some real-life applications. Because bacteria are sensitive to many kinds of environmental pollutants and organisms, the scientists believe this approach could be also used to design low cost bacterial biosensors capable of detecting an array of heavy metal pollutants and disease-causing organisms. And because the senor is composed of living organisms, it can respond to changes in the presence or amount of the toxins over time unlike many chemical sensors. The development of the techniques to make the sensor and the flashing display built on the work of scientists in the Division of Biological Sciences and School of Engineering, which they published in two previous Nature papers over the past four years. In the first paper, the scientists demonstrated how they had developed a way to construct a robust and tunable biological clock to produce flashing, glowing bacteria. In the second paper, published in 2010, the researchers showed how they designed and constructed a network, based on a communication mechanism employed by bacteria, that enabled them to synchronize all of the biological clocks within a bacterial colony so that thousands of bacteria would blink on and off in unison. But the researchers found the same method couldn’t be used to instantaneously synchronize millions of bacteria from thousands of colonies. “If you have a bunch of cells oscillating, the signal propagation time is too long to instantaneously synchronize 60 million other cells via quorum sensing,” said Hasty. But the scientists discovered that each of the colonies emit gases that, when shared among the thousands of other colonies within a specially designed microfluidic chip, can synchronize all of the millions of bacteria in the chip. “The colonies are synchronized via the gas signal, but the cells are synchronized via quorum sensing. The coupling is synergistic in the sense that the large, yet local, quorum communication is necessary to generate a large enough signal to drive the coupling via gas exchange,” added Hasty. Graduate students Arthur Prindle, Phillip Samayoa and Ivan Razinkov designed the microfluidic chips, which for the largest ones, contain 50 to 60 million bacterial cells and are about the size of a paper clip or a microscope cover slip. The smaller microfluidic chips, which contain approximately 2.5 million cells, are about a tenth of the size of the larger chips. 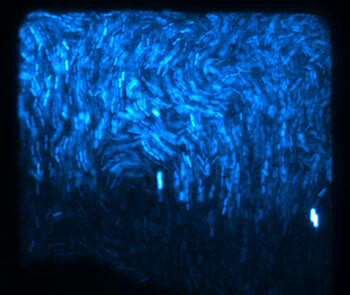 Each of the blinking bacterial colonies comprise what the researchers call a “biopixel,” an individual point of light much like the pixels on a computer monitor or television screen. 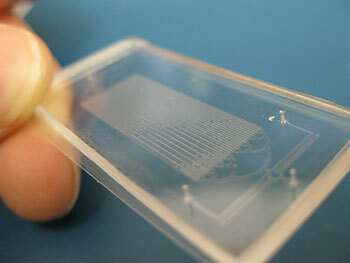 The larger microfluidic chips contain about 13,000 biopixels, while the smaller chips contain about 500 pixels. Other UC San Diego scientists involved in the discovery were Tal Danino and Lev Tsimring.